and-search operation in Gardez, Afghanistan. operating costs in the coming years. Although Valhalla is still getting set up for formal admissions and full operations next spring, Specialist Jennifer Manning drove for six hours from Fort Riley, Kansas to help us build a permanent pen for the Guinea fowl. This makes her the very first Valhallan to stay on the property and take part in our first (albeit simple) building project. We first met then-Private First Class Manning in Gardez, Afghanistan where she was working as a gunner for the 92nd Military Police Company in the Spring of 2010. 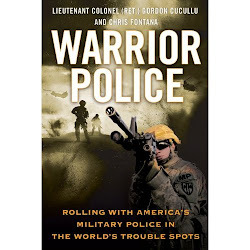 She is briefly mentioned several times in the book Warrior Police and ironically was one of the Soldiers who somewhat accidently helped inspire the Valhalla Project concept itself. 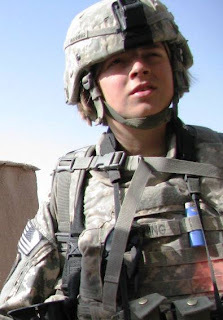 Even as a young enlisted Soldier she took us under her wing during our embed, making us feel both welcome and safe. Valhalla will return that favor for her and many other Soldiers. 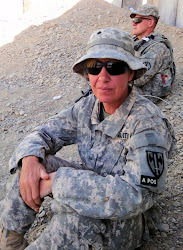 Jen is now preparing to deploy back to Afghanistan again early next year with the Headquarters and Headquarters Company 4th Brigade Special Troops Battalion (1st Infantry Division) and therefore has a lot on her plate, to say the least. Yet after many months of regularly instant messaging with us over Facebook and staying in contact, she really wanted to come see the new pilot property with her own two eyes. And since she'll be on her second tour when Valhalla is officially opened next spring, it was decided that she should at least have the chance to participate in this initial preparatory phase while becoming the first official Valhalla Soldier. 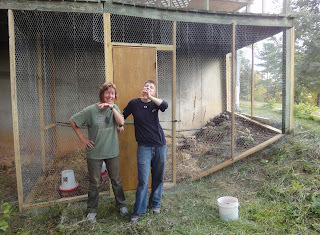 poultry wire for the new Valhalla Guinea Fowl Palace. Everybody works, and everybody has fun. Valhalla's recreational programs are not in place yet, but we all sure worked hard this weekend and still had a lot of fun doing it in the process! 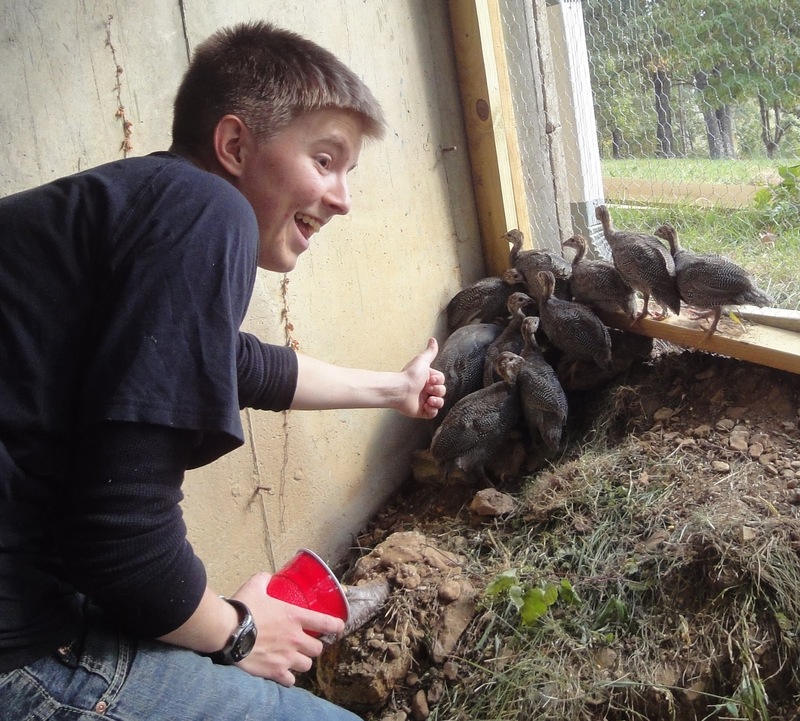 Challenge: the growing Guinea fowl flock didn't have a secure outdoor coop to sleep in at night, three of the 18 went missing over the last few days (and may have been snatched up by owls, coyotes or other predators), while Valhalla has nine younger keets that are quickly outgrowing their brooder. 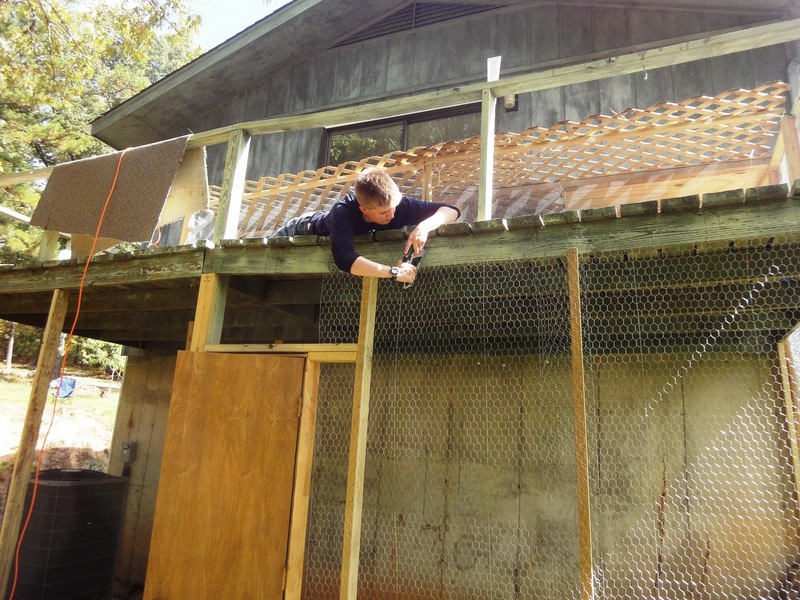 Mission: build a secure Guinea Fowl Palace in the unused space under the deck at the back of the house, then move both the keets and young adults into it without getting maimed. Jen accepted this specific mission weeks ago for her long Columbus Day weekend while knowing full well that it might involve sweat, effort, creativity, and possible exposure to small quantities of poultry manure. clear the coop before introduction of birds. The appointed Palace space is abutted by a steep hill that we didn't want to disturb or dig out, so framing was a bit of a challenge. However, during earlier safety renovations to the house - when various doorways were widened for possible future wheel chair access - an entire narrow door frame with its matching door were removed and stashed in the basement. They were retrieved for this Guinea Palace project. The completed Guinea Fowl Palace. After framing with a series of 2x4s and 2x2s nailed into the existing deck, poultry wire was then tacked on with a 6" skirt at the bottom to help keep predators from digging their way in. Jen certainly proved herself with a circular saw and drill. Then the hardest part of all: transporting the nine keets from their brooder upstairs. I crawled into their 2' high brooder on my hands and knees to shoo them into a corner where Jen and Gordon could grab them - it was a messy job as the frantic birds panicked, landed on my back, and otherwise attempted to evade capture. keets as they adjusted to their new home. In the end we successfully captured them all, although one little bird burst out of the cardboard transport box and ran straight up the side of a tree! Perched on a small limb some 18' up Jen tried to startle him down by tossing sticks around him, but he wouldn't budge until Gordon arrived with a pole. Eventually we were able to herd him through the Palace door to join the rest of the small flock, and within minutes the Guineas were happily pecking away in the straw lining their new home. workers who come to stay for periods of time. 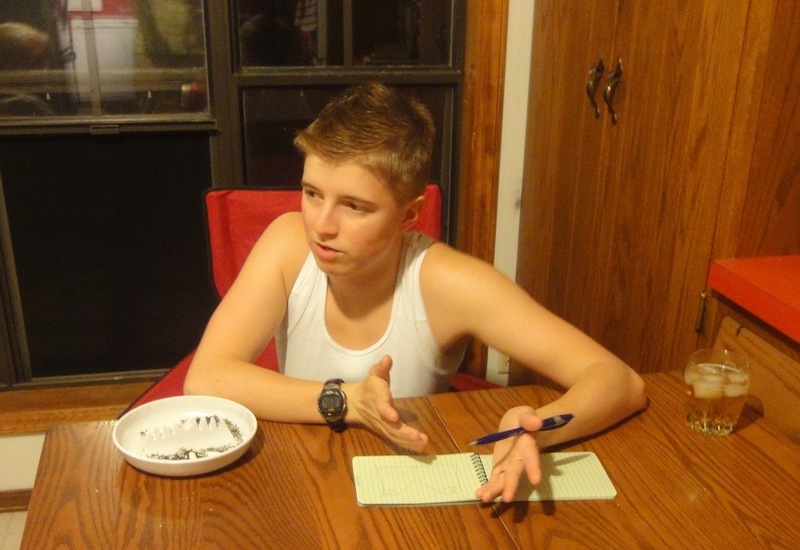 Knowing that the plan is to have ten people staying for weeks at a time at Valhalla by next spring and eventually working for a population of up to 50, Jen decided to start planning out a paint ball recreational program for different terrain features around the property. In her extremely limited spare time and as a hobby while deployed downrange she'll be mapping out boundary locations, safety procedures and playbook strategies while knowing that some day she'll be able to come back and put her plans into action. Meanwhile, we'll be working on getting the necessary gear to help make her vision into a reality!